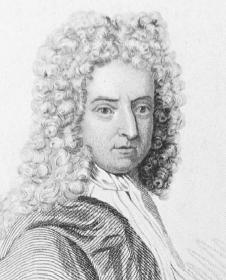 Daniel Defoe was the first of the great eighteenth-century English novelists. He wrote more than five hundred books, pamphlets, articles, and poems. Little is known about the birth and early childhood of Daniel Defoe, as no baptism record exists for him. It is likely that he was born in London, England, in 1660. James Foe, his father, was a butcher by trade and also a Protestant Presbyterian (considered to be a person who thought differently and did not believe in or belong to the Church of England). (Daniel Defoe added the De to his original last name Foe when he was forty.) He had a sister, Elizabeth, who was born a year earlier. When he was ten, his mother died. He had early thoughts of becoming a Presbyterian minister, and in the 1670s he attended the Reverend Charles Morton's famous academy near London. In 1684 Defoe married Mary Tuffley, who brought him the handsome dowry of 3,700 pounds. They had seven children. Defoe participated briefly in the Monmouth Rebellion of 1685, a Protestant uprising, but escaped capture and punishment. From 1685 through 1692 he engaged in trade in London as a wholesale hosiery agent, an importer of wine and tobacco, and part owner and insurer of ships. Defoe evidently did business with King William III (1650–1702). He suffered losses from underwriting marine insurance for the king and was forced to declare bankruptcy in 1692. Although he settled with the people to whom he owed money in 1693, he faced the threat of bankruptcy throughout his life and faced imprisonment for debt and libel (the crime of writing or publishing untrue statements that harm other people) seven times. Arrested in 1703 for having published The Shortest Way with the Dissenters in 1702, Defoe was tried and sentenced, put before public abuse, and taken to prison. Robert Walpole (1676–1745) released him five months later and offered him a post as a government agent. Defoe continued to serve the government as journalist, pamphleteer, and secret agent for the remainder of his life. The most long-lived of his twenty-seven periodicals, the Review (1704–1713), was especially influential in promoting the union between England and Scotland in 1706 and 1707 and in supporting the controversial Peace of Utrecht of 1713 (one of the greatest peace settlements in history that balanced power in Europe). Defoe published hundreds of political and social documents between 1704 and 1719. His interests and activities reflect the major social, political, economic, and literary trends of his age. He supported the policies of William III and Mary after the Glorious Revolution of 1688 and 1689, and analyzed England's growth as the major sea and mercantile (having to do with merchandise and trade) power in the Western world. He pleaded for sympathy for debtors and defended the rights of Protestant dissenters (people who opposed the beliefs of the Church of England). He used newspapers and journals to make his points. His first major work, An Essay upon Projects (1697), proposed ways of providing better roads, insurance, and education to be supported by "a Tax upon Learning, to be paid by the Authors of Books." Many of these topics reappeared in his later works. In 1701 Defoe published The True-Born Englishman, the most widely sold poem in English up to that time. He estimated that more than eighty thousand copies of this defense of William III against the attacks of John Tutchin were sold. Although Defoe's The Shortest Way with the Dissenters (1702), which ridiculed the harshness of the Church of England, led to his arrest, the popularity of his Hymn to the Pillory (1703) indicated the favor that he had found with the London public. At the age of fifty-nine, after a full career as businessman, government servant, political pamphleteer, and journalist, Defoe began a career as novelist. Within six years he produced six novels, all of which gave him his greatest fame. Adventures in 1720. That year he published another travel novel, The Life, Adventures, and Pyracies of the Famous Captain Singleton. Defoe published comparatively little in 1721, because he was hard at work on the three major books that were to appear the following year. In January 1722 he published The Fortunes and Misfortunes of the Famous Moll Flanders, probably the most successful of his novels. A Journal of the Plague Year, issued in March 1722, presented a picture of life in London during the Great Plague of 1665; it was thought to be history rather than fiction for more than a hundred years. His third novel, The History and Remarkable Life of the Truly Honourable Col. Jacque, was published in December 1722. In 1724 and 1725 Defoe published four successful books, each displaying his characteristically clear, strong English words. The Fortunate Mistress; or, … Roxana was the first of three in 1724. The second, A Tour Thro' the Whole Island of Great Britain was one of the most thorough guidebooks of the period, and the third, The History of the Remarkable Life of John, was one of his finest criminal biographies. The True and Genuine Account of the Life and Actions of the Late Jonathan Wild was the fourth book, published in 1725. Although he continued to write, only a few of Defoe's later works are worthy of note: The Complete English Tradesman (1725), The Political History of the Devil (1726), A New Family Instructor (1727), and Augusta Triumphans (1728), which was Defoe's plan to make "London the most flourishing City in the Universe." Daniel Defoe died at age seventy-one on April 24, 1731, outside of London, England. Hunter, J. Paul. The Reluctant Pilgrim. Baltimore, MD: Johns Hopkins Press, 1966. Moore, John Robert. A Checklist of the Writings of Daniel Defoe. Bloomington: Indiana University Press, 1960. Secord, Arthur W. Studies in the Narrative Method of Defoe. Urbana: University of Illinois Press, 1924. Trent, William P. Daniel Defoe, How to Know Him. Indianapolis: Bobbs-Merrill, 1916. Reprint, New York, Phaeton Press, 1971.
hey everybody. Did you know that Defoe created the framework for realistic fiction?